We already know a lot about ferrets’ food. However, the information about the eggs is controversial. Have you got several conflicting opinions? I’ll try to clear the things up. Thus, can ferrets eat eggs? Let’s discuss it. What Do Ferrets Eat in the Wild? What Kind of Human Food Can Ferrets Eat? Can I Give My Ferret Scrambled Eggs? Ferrets are carnivores. They are hunters and meat-eaters by nature. Thus, ferrets are often compared with cats. Dogs can behave like omnivores. They eat everything, including vegetables and grains. Small rabbits and birds can be also eaten. I think that Goof would eat anything he finds in the room. Why doesn’t he eat me? I think that I am too large for the chase. As to the small prey, ferrets eat them in whole. Bones are edible and even beneficial for your pets. Only raw bones, not cooked. Meanwhile, what happens if your pet finds a bird egg? Of course, the ferret would roll it, break the egg open and eat. This food is nutritional and delicious for ferrets. However, what a mess! Are there any health concerns? As the doctor Johnson-Delaney states, ferrets come from European polecats. However, nowadays, domesticated animals can be fed cat and mink food. In accordance with the research, a commercial diet for ferrets is to be rich in proteins. Minerals like calcium, potassium, and phosphorus are to be available, as well. Thus, the best ferret food is a kind of meat-based diet. Grains are not acceptable. Mustelids get carbohydrates only from their prey. Yes, they consume not only the bones but the gut content. Some fructose is acceptable. At least 3 types of meat are to be available. The diet should include red meats, like beef. Chicken or turkey is essential. Bones are more than necessary. For example, the daily ferret food may include turkey necks, beef, and Cornish hen bones. What about the portions? An adult ferret should consume the given amounts of food every day. The food quantity should not exceed 5% of the ferret’s weight. Yes, it’s true! The amounts are really tiny! These sparse ounces are divided into several parts or intakes. However, when I am busy, I feed Goof 2 times a day: in the morning and at night. The pets consume about 0.5 pounds of fresh water per pound of the ferret’s weight (per day). However, fresh water is to be always accessible. Treats are to be available. They can make up to 10% of the daily intake. For example, Goof likes sultanas most of all. I have them softened in hot water and feed my lovely pet. Only when he deserves it. I give him sultanas about 2 times a week. The quantity should not exceed a teaspoon. Meanwhile, chicken liver, raw or cooked eggs may become the favorite treats for the ferret. 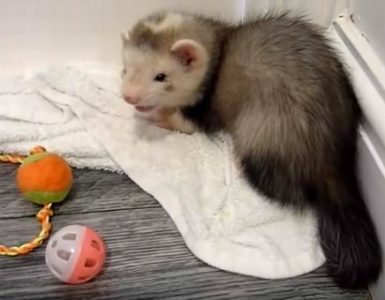 Ferrets adore eggs in all forms. Meanwhile, 1 hen egg per week is sufficient. How much does it weight? About 1.5 oz.? That’s enough. What about separating yolks and whites? Yes, boiled egg white in your pets is digested better than raw. The raw yolk is preferable. Anyway, the whole egg is safe to be given. So, ferrets eat eggs. In any form. They just have to be given in adequate quantities, as treats. Would you like to avoid the mess? Boiled eggs are ok. They are quite nutritional. So, I wish a healthy and long life to your ferret! And I hope, no need to consult a vet.